Size of this preview: 424 × 600 pixels. Other resolutions: 169 × 240 pixels | 636 × 900 pixels. 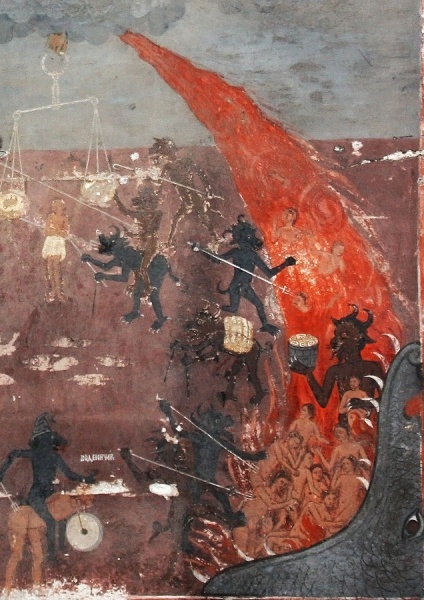 current 20:34, 5 July 2015 636 × 900 (159 KB) TimSC (talk | contribs) Photo ''А fresco detail of Hell from the medieval church St. Nicolas in Raduil village, Bulgaria'' by Edal Anton Lefterov Source: https://commons.wikimedia.org/wiki/File:Hell-fresco-from-Raduil.jpg License: https://creativecommons.org/licenses/by-sa/3. This page was last modified on 5 July 2015, at 20:34.